Bovine spongiform encephalopathy (BSE) is a progressive, fatal, neurologic disease of adult domestic cattle that resembles scrapie of sheep and goats ( Scrapie: Introduction). It was first diagnosed in Britain in 1986. BSE has been transmitted experimentally to mice, pigs, sheep, goats, cattle, mink, Macaque monkeys, and marmosets. During the epidemic of BSE in Great Britain, small numbers of cases of spongiform encephalopathy were seen in several species of captive bred ungulates (nyala, gemsbok, eland, arabian oryx, kudu, scimitar oryx, ankole cow, and bison) and in 5 species of felids (puma, cheetah, ocelot, lion, and tiger) either kept in or originating from British zoologic collections. A low incidence has been seen in domestic cats in the British Isles, with one isolated case in Norway. The ungulates were infected from the same foodborne source as cattle (see below), and all species of felids were most likely infected by consuming infected bovine tissues.Bovine spongiform encephalopathy (BSE) is a fatal transmissible neurological disorder of cattle that is associated with accumulation of protease-resistant prion protein. There is an insidious onset of signs which generally leads to slaughter in 1 week-14 months. Histopathologic examination shows bilaterally symmetrical degenerative changes in brain stem grey matter with discrete ovoid and spherical vacuoles and microcavities in the neuropil. BSE has been experimentally transmitted to sheep and goats, in which it produces a disease resembling scrapie, and there has been a report in the press that naturally-occurring infection was found in a goat. Only the UK has experienced a significant epidemic that, at its peak at the end of 1992, represented an annual incidence of about 1% of adult cattle. Lower incidences have been seen in indigenous cattle in Ireland, France, Switzerland, the Netherlands, Portugal, Germany, Denmark, Italy, Spain, Austria, Belgium, the Czech Republic, Finland, Greece, Israel, Japan, Liechtenstein, Luxembourg, Poland, Canada, Slovakia, and Slovenia. BSE has been detected in the majority of these countries as a result of active surveillance . Cases in animals exported from Great Britain have been seen in Canada, the Falkland Islands, and the Sultanate of Oman. Cattle populations in other countries may have become infected as a result of the importation of cattle and/or ruminant-derived meat and bone meal from countries with the disease. Brain. 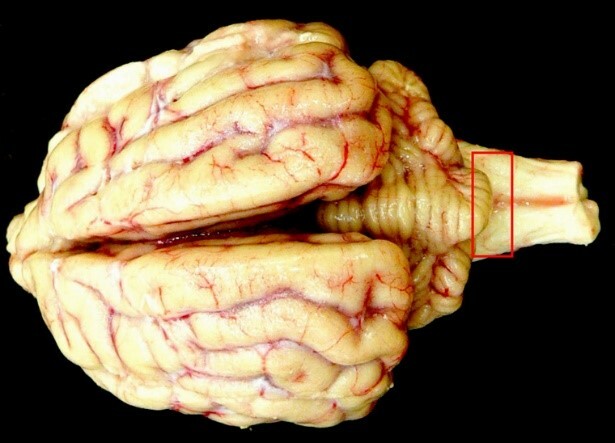 The red box indicates the region of the obex, which is the portion of the brain that must be obtained for the diagnosis of BSE and other spongiform encephalopathies such as scrapie and chronic wasting disease. BSE. Degenerative lesion in the cerebral cortex. Repeated clinical examinations do not provide a definitive diagnosis. The accepted international confirmatory diagnostic methods on the hindbrain are histopathology, immunohistochemistry (IHC), and electron microscopy, after detergent extraction, for scrapie-associated fibrils to detect abnormal PrP. The last 2 methods can be used on autolyzed brain tissue and IHC positivity precedes morphologic, vacuolar changes. Two specific ELISA methods and a Western immunoblot method are available for active surveillance of cattle populations. Diagnosis can be confirmed only on the postmortem histological examination of brain tissue. 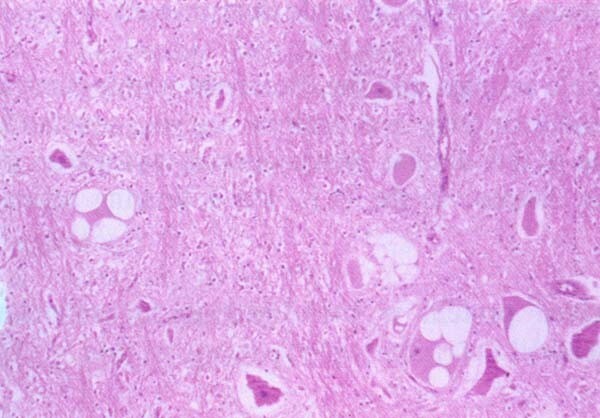 Microscopic lesions include degenerative lesions of the cerebral cortex (see fig), medulla and central grey matter of the midbrain. The furious form of rabies (Rabies) has clinical similarities, but the clinical course of BSE is more protracted. Other differential diagnoses include encephalitic listeriosis ( Listeriosis), hypomagnesemia ( Hypermagnesemia), Lead poisoning ( Lead Poisoning), Downer cow syndrome ( Problematic Bovine Recumbency), Nervous ketosis, Intracranial abscess or tumors, lesions in the CNS, and trauma to the spinal column. The protracted clinical course of the disease is helpful in differentiation, but in a small proportion of cases the clinical duration is short (days or weeks), and the extent that animals have been observed needs to be considered.